Update on the outbreak of Arcitc airmass into Europe: the cold airmass with subzero temperatures has spread across much of northern Europe and is currently pushing across central and eastern Europe as well as across the British Isles. Winds reaching 60-100 km/h are blowing across northern Germany, Denmark, the Netherlands and the North Sea as well as the British Isles. NASA Terra MODIS image of the cold outbreak spreading across Europe. March 17. Temperatures across Europe on Saturday evening. 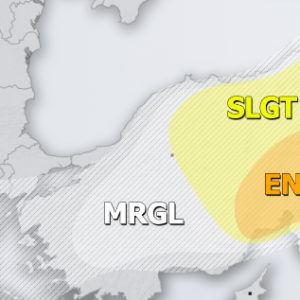 Map: Meteociel.fr. The polar airmass will move across the British Isles and central Europe by mid-Sunday. Temperatures at 850 mbar level will be 8 to 12 °C below average for this time. By mid-Monday, the airmass will have warmed somewhat, with temperatures down to 8 °C below average for this time (at 850 mbar level). On Tuesday the pattern flips, with new systems being pushed from the west: the cold airmass is pushed eastwards across the Iberian peninsula into western and central Mediterranean, as well as northern Africa.